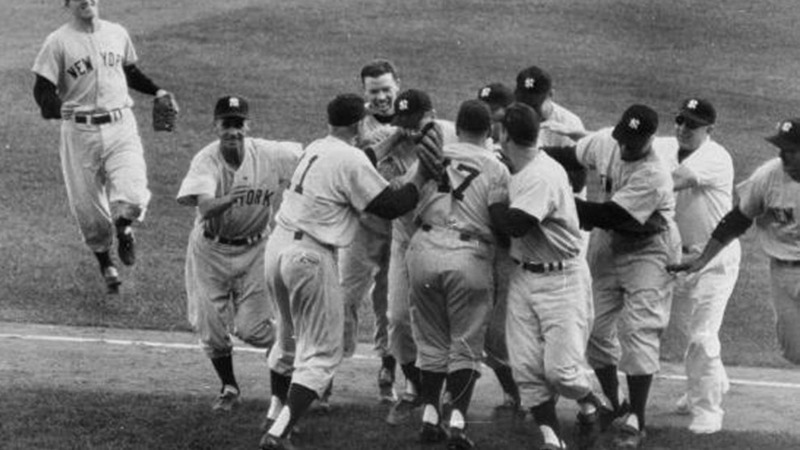 The 1958 World Series was a rematch of the '57 Fall Classic, and the Yankees were looking for revenge. They didn't get it in the opener, however. With two outs in the bottom of the 10th, Milwaukee's Bill Bruton lined a single into right-center field, scoring Joe Adcock with the decisive tally in the Braves' 4-3 triumph. The next day, the Braves knocked out two Yankee hurlers in the very first inning, romping to a 7-1 lead with Lew Burdette capping things with a three-run homer. Burdette pitched a complete game to earn a 13-5 decision. The clubs took a day off, then resumed play at Yankee Stadium. Don Larsen, famous for his perfect game in the '56 Series, tossed seven shutout innings before giving way to relief ace Ryne Duren, who completed the whitewash. Meanwhile, right fielder Hank Bauer accounted for all four Yankee runs with a two-run single in the fourth and a two-run homer in the seventh. Game 4 featured a rematch of the Game 1 starters, Ford and Spahn, and again Spahn came out ahead, this time tossing a brilliant two-hitter to beat the Yanks, 3-0. Bob Turley -- knocked out in the first inning of Game 2 -- nearly matched Spahn in Game 5, tossing a five-hit shutout and fanning 10 Braves. The Yanks scored seven runs, six of them coming in the bottom of the sixth. Game 6 matched, for the third time in the World Series, Ford and Spahn. Neither went the distance, though Spahn got a lot closer than Ford. The Braves scored once in the first and again in the second, and Ford went to the showers. His replacements fared significantly better, and at the end of regulation the contest was tied, 2-2 with Spahn still in action. Gil McDougald led off the 10th with a homer off Spahn, and the Yanks added another run later in the inning. That second run proved important when the Braves scored a single run in the bottom of the inning to make the final score 4-3. With everything at stake in Game 7, the clubs battled to a 2-2 tie through seven innings. In the top of the eighth, Yogi Berra started a two-out rally with a double, and scored the go-ahead run on Elston Howard's RBI single. Two batters later, Moose Skowron took Burdette deep for a three-run homer, and the Series was essentially over. It ended 6-2, the Yankees taking revenge for their Game 7 defeat 364 days earlier.